Valentino Rossi was born on February 16, 1979 in Urbino, Italy. Vale, as the afficionados call him, is not only one of the best racers of all time, but also a true sports lover. 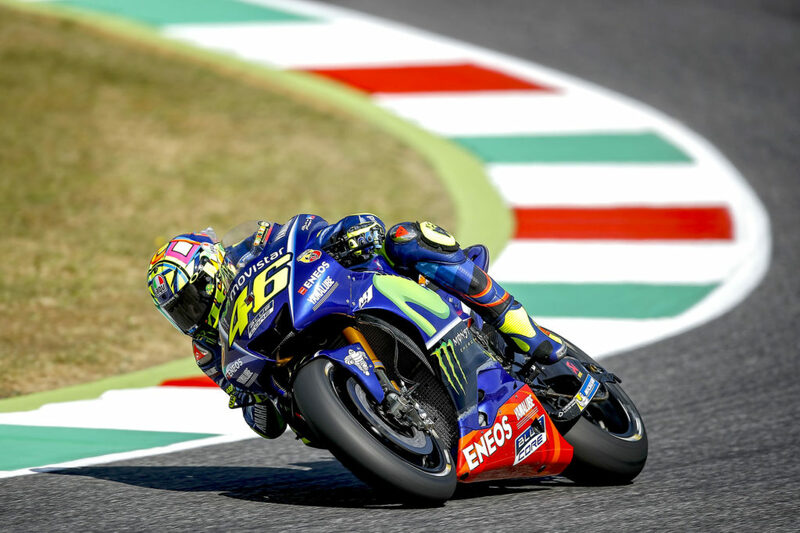 Also known as ‘The Doctor’, 38-year-old Valentino Rossi has claimed 225 podiums, including 115 victories, 64 pole positions and nine world titles. This champion, whose last world title was won in 2009, is one of this season’s favourites. On August 3rd, 2017, My Italian Link was given this exclusive interview directly from the pit lane of the Czech Republic’s Brno MotoGP. Valentino Rossi bending right on his Yamaha bike. MIL: Why the number 46? Valentino Rossi: I was just a kid, riding minibikes. I was watching the Suzuka Grand Prix on TV with some friends, and we were staring at this wild-card driver who was doing incredible things in the pouring rain. He was actually number 46. I then decided to use it. I changed it for a while during my experience in the Italian Championship and in the European one. I eventually got to compete in the World Championship, and started using it again as I was forced to pick a number. I discovered that it was the same number my dad, Graziano used when he won his first GP, racing on the Morbidelli 250, in 1979. The very year I was born. That is why I have decided to have 46 as my number for the World Championship. That number represents my career and in some ways my life too! MIL: After a good start in this year’s championship, you’ve been unlucky in a few races. What is your feeling concerning the rest of the championship? Valentino Rossi: This is a very uncommon championship. In each leg there are unexpected things happening. You could be very fast and experience problems, and so do your competitors. The good thing so far, is that we are so close to each other in the ranking that we could expect a new leader after each race! My goal is always to at least be on the podium, have a good race, have fun and bring home as many points as possible! I trust I’ll have a few more victories in the World Championship by very end of the season! MIL: What do you think of Maverick Vinales, your new teamate at Yamaha? Valentino Rossi: His start of season was simply amazing. I knew Maverick would be strong with our bike, but I did not expect him to be so fast! Last year, he had already shown great race-pace with Suzuki. At the end of the year he actually had picked up a lot of points. At first I hoped he’d still need a bit of time. It was not a big surprise to me, I knew about his talent, but still, I was a bit surprised that he was so fast from the very beginning of the season. Also, the races are really different compared to the tests and he has had difficulties repeating his times there. He remains strong and we are all very close in line for the championship title. I bet Maverick will make a great opponent! 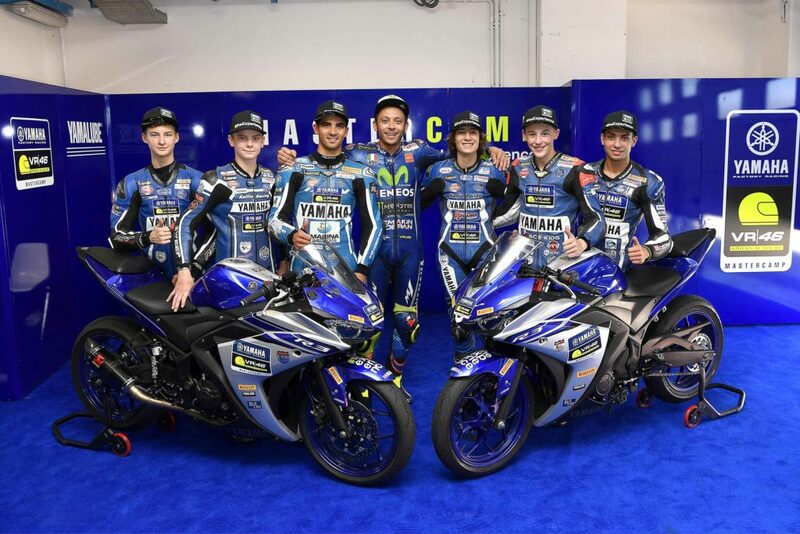 Valentino Rossi and Maverick Vianles, both riders for Team Yamaha. MIL: You’ll be racing your home circuit, Misano, in September. Are you looking forward to it? Valentino Rossi: Is it a lot of pressure racing in front of the people that look up to you? Racing in Misano is always special to me. It’s like when I’m at Mugello, because it’s the Italian GP, but I feel the same about the Misano circuit, which lies close to my home. All my friends, family and fans will be there. It is quite challenging to concentrate during my home ground GP, because of all the distractions and the supporters all around me, but it is also reassuring and good to feel all the support of so many people. The atmosphere is always sensational there and really gives me a boost! 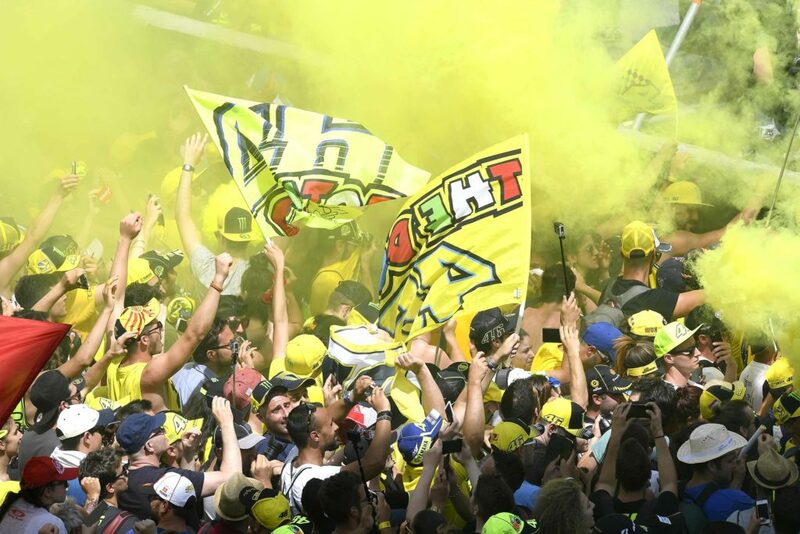 Yellow and 46 everywhere to support Valentino Rossi! MIL: You thought about racing in Formula One, but changed your mind and stuck with MotoGP. Any regrets? Valentino Rossi: At some point in my career I seriously had a chance to race in Formula One, but I preferred to continue in MotoGP. I thought about it a lot, the tests had gone well, but I’m happy with the choice I made, because from that moment I won a lot of races in MotoGP. In the future I will definitely go back at racing cars, though not in Formula One, I assume. I’ll probably be way too old then! But I also love car racing and track racing. We’ll see! Each circuit is filled with thousands of yellow flags, tee-shirts, hats, #46 fans, etc. MIL: How would you describe the enthusiasm/passion you have created in motoGP for the past 20 years? Valentino Rossi: Passion is the key to everything! I have always belonged on a motorcycle, and I could not imagine myself doing anything else. If I were not a motorbike rider, I would definitely like to be a sportsman anyway. I approached the motorcycle basically as a newborn. My father was a rider and I always went with him when he was training or racing. Passion for racing has accompanied me throughout my career and continues to be as strong today. The most important thing is to continue to revel. When you stop having fun is when its time to stop. The VR46 brand was born because so many motorcycle enthusiasts and racers work the way I do… driven by passion! Then everything works better! MIL: How did the idea of the VR46 Academy emerge, and what is its goal? Why is training young drivers important to you? Valentino Rossi: At the very beginning it all started because of Marco Simoncelli. He was actually the first riders of the academy. It all started with him. In the past I used to be very jealous of his training sessions, but when Marco asked me to give him a hand, we started to work side by side. Then Franco Morbidelli also joined us and shortly afterwards, along with my collaborators, we decided to give life to the academy in order to help young Italian riders on the path to becoming professional racers. Today there are several riders in the academy, eleven at the moment, and everyone is enjoying the journey and achieving interesting results. They also help me feel young! We often train together. On the weekends I’m not busy with MotoGP, You’ll normally find me at the ‘ranch’ with the boys of the Academy and a few friends, performing doughnuts! It’s good training and it has helped me so much with regards to the physical training. But above all, it’s great fun! I also do a lot of workouts at the gym, but sitting on a bike will always be my favourite activity. Always! Helping young Italian riders on the path to becoming professional racers. 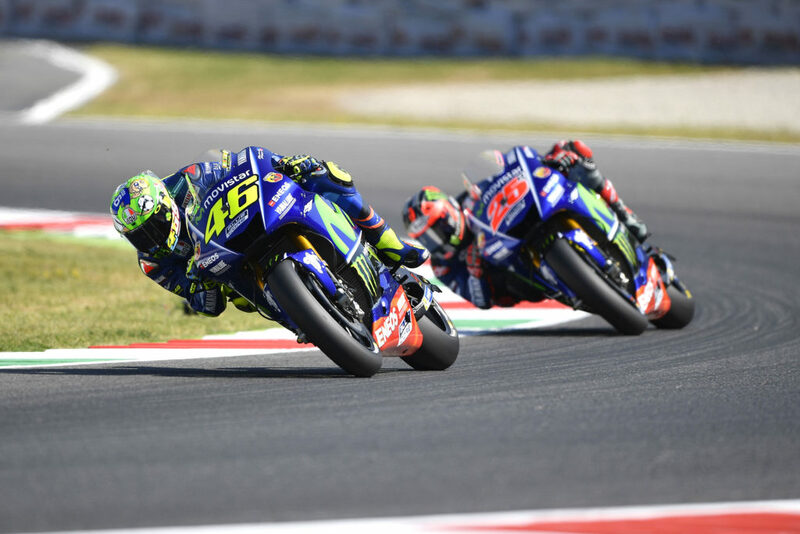 The 2017 MotoGP San Marino Grand Prix will take place from September 8th to 10th (race on Sunday 10th). Each year this race is held in Misano Adriatico, a few kilometres from the city of San Marino and Rimini, and about 170km from Florence. The Misano circuit was built between 1970 and 1972, but has been modified several times. It has been lengthened from 3.5km to 4.2km (16 turns). In 2012 the circuit was renamed the Misano World Circuit Marco Simoncelli in tribute to the late rider, Marco Simoncelli, who died aged 24 during the Malaysian GP in 2011. The Misano World Circuit can host 70,000 spectators! One Italian Grand Prix takes place on the 3rd of September at it’s usual location on the circuit at the Autodromo Nazionale in the city of Monza, north of Milan. This season, the Monza circuit will host the 13th of 20 rounds. The track has been a staple in the Formula One calendar since the sport’s inauguration in 1950. The lap record for this almost 6km track has been held by Rubens Barrichello since 2004, at 1:21:046. However it’s Scuderia Ferrari who hold the record for the most wins (19 in total) on their hallowed home ground.